Beautiful and famous Dishonored game, that was released last year, will get the Game of the Year Edition, which will be out tomorrow, on the 8th of October. Today the developers have revealed a new trailer of this game's version and we would like to remind you about the content of Dishonored: GOTY. 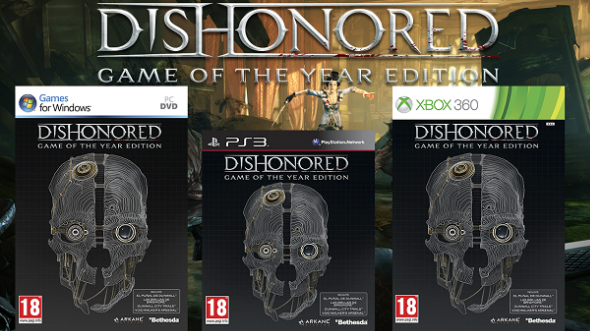 Dishonored: Game of the Year Edition will consist of the game itself and all its DLCs. The most interesting ones among them are The Knife of Dunwall and The Brigmore Witches - two story-based add-ons that give you a role of Daud. Daud is an assassin, who killed the Empress from the main game. He uses various unusual weapons and gadgets, and also has magical abilities. In addition in Dishonored: GOTY you will get Dunwall City Trials - a pack that consists of 10 maps. Here you will be able to experience the combat and stealth of the game, get new achievements and put your name on the top of the online leaderboard. And the last pack - Void Walker's Arsenal - consists of special content for character. This add-on previously was available only for those, who have pre-ordered Dishonored.